Michelle Sopp is the director of development for the Oklahoma Hall of Fame. In this role, she oversees financial and resource development, ensuring delivery of the organization’s mission. Michelle serves as primary contact for donors and is responsible for volunteer management of the Second Century Board. Originally from a small town in mid-Missouri, Michelle spent nearly 10 years in the Kansas City metro area working in various business development roles. She moved to Oklahoma in 2010 and soon after found her true calling in nonprofit work. 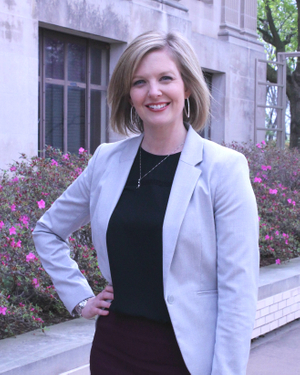 Most recently, Michelle worked for the Oklahoma Society of CPAs as the Vice President, Learning and as the Membership Manager prior to that. Michelle holds a bachelor’s degree in marketing and a bachelor’s degree in advertising, both from Northwest Missouri State University in Maryville, MO. She currently resides in Oklahoma City with her husband, daughter and two dogs. She enjoys attending concerts and assisting with her daughter’s soccer team.